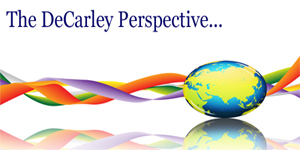 We issued a DeCarley Perspective newsletter in early January arguing a bearish case for crude oil; however, as February approaches we are beginning to look for a place to take the other side of the trade. Seasonal tendencies suggests that crude oil futures often find a significant bottom in early to mid-February and rally into May; with crude prices nicely off the highs, there could be a buying opportunity in the near future. In fact, the Commodity Trader's Almanac suggests buying crude oil futures on the 10th trading day of the month and holding for approximately 60 days has yielded a profit about 85% of the time over the last 28 years for an accumulative gain of about $100,000. The cause of higher crude oil futures during the spring months is increased demand for heating oil and diesel fuel in the northern states, combined with increased production of gasoline in anticipation of the summer driving season. In other words, refiners begin to stockpile crude oil early in the year to ensure they can meet demand for gasoline mid-year. It is hard to justify becoming immediately bullish because the January dip has been tepid; the low volatility decline likely hasn't been successful in shaking the bulls out of the market (AKA running the sell stops beneath support). Simply put, we feel like thee are sell stops lining the downside waiting to be elected. Also, bullish complacency in both equities and commodities seems to be running rampant and that is often a precursor to downward volatility. Our chart-work suggests the pullback could see prices as low as $90 per barrel based on the April contract. However, we begin to be "interested" in the $92/$93 range. Stay tuned for specific put option selling recommendations on a futures price spike lower to noted levels. If we are right about the near-term dip and subsequent recovery, we'll be looking for an eventual return to the $100 level which is where it has been most comfortable since November.